Laxmi Kant Tiwari, Convenor, Uttrakhand Uthan Parishad, Chandigarh briefing a press conference today in KLG hotel, Sector 43, Chandigarh. Chandigarh, November 11, 2016 : Uttrakhand Uthaan Parishad will be orgnaising a day-long seminar themed as ‘Pravasi Panchayat’ on November 13, 2016 at Law Bhawan, Sector 37, Chandigarh. The objective of this seminar to bring a sense of awareness how Uttrkhandi migrants can contribute in developing their home state. Known educationalists, academicians from Chandigarh and home state will be participating in the eventt. His Excellency Governor of Haryana, Mr Kaptan Singh Solanki, JagadGuru Swami Rajrajeshwarashram, Anil Vij, Health and Sports Minister, Govt of Haryana, Dr. Dinesh, Head, Akhil Bhartiya Gram Vikas, RSS, Prof Tankeshwar, VC, Guru Jameshwar University, Hissar and will be enlightening the delegates their deliverables. The members of Garhwal Sabha, Kumaon Sabha and other NGO will also be the part of this day long seminar. 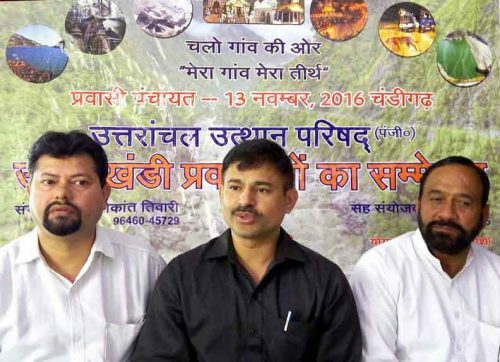 According to Luxmi Kant Tewari, Convenor, Uttrakhand Uthaan Parishad, “Migration is mounting concern for the hill state of Uttrakhand which is resulting the draining of entire talents from home. This event will be catalyst to change the mindset of natives and migrants which will eventually contribute for the development of state.